COLLECTING BAKELITE RADIOS AND OTHER ITEMS OF THIS WONDEROUS MATERIAL CAN BE FUN ...HONEST !! Important large historic Ekco Radio Sign uncovered by workmen in Southampton England, see my Brief Encounter of an Ekco Kind page for image and details !! VISITORS TO THIS SITE SO FAR !! THANKS FOR THE VISIT !! !, Please come back !!! Jools. 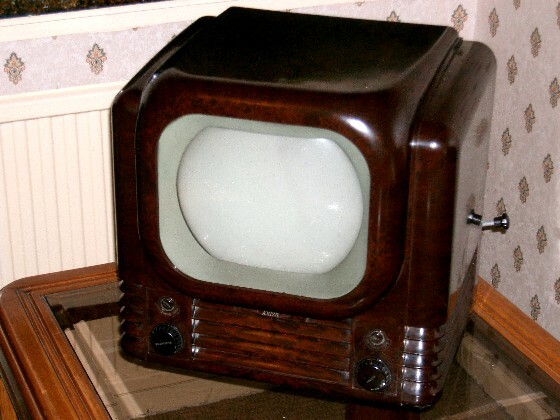 Above my pride and joy an Ekco AD36 from 1935 added to the collection February 2006, Below another one of my favourites a Bush TV22 1950 ..... both of these pieces are classic bakelite designs separated by 15 years which I feel shows the versatility of this wonderous material. Both of these bakelite icons have their own respective pages within my site.. Jools. Below appears a stylish BUSH DAC 10 Radio from 1950, added to the collection May 2004. 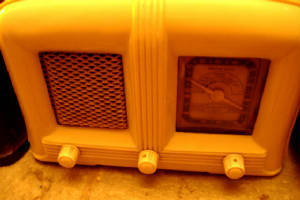 Before and after bakelite renovation pics can be seen on the Radio/Audio 3 page ... please take a look !!! Greetings one and all !!! you have accessed the website of JOOLS ZAUSCINSKI an unashamed collector of Bakelite, a phenolic freak and anorak of associated old plastics !!! watch this site for Bakelite info and details of all additions to my collection. 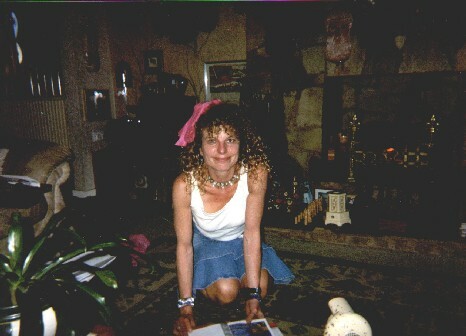 Hi, I'm Jools K Zauscinski and I was born in the East end of London, Stepney Green to be precise... many moons ago !!! What's New...? ....... This site will be updated weekly,please keep checking it out .... Bookmark using the MIND IT facility on this page for automatic update notification. March 2006 ... A lovely black Tesla Talisman 308 U Bakelite radio added to the collection, classic design, sometimes called the teardrop, made in the old Czechoslovakia, now the Czech Republic, during the 1950's. Images and details soon to appear on my new page dedicated to this stylish set!! details and images and the story behind this set appear now on a new specially created page for this classic beauty... BRIEF ENCOUNTER OF AN EKCO KIND !! Please take a look .... an elated Jools !!!! January 26th 2006 ... Already I've managed to add some nice new examples to my Bakelite collection for the start of a New Year, these to appear on my newly created NEW ADDITIONS PAGE for 2006, one of the stars being a superb table lighter, THE CLASSIC JUMBO LIGHTER pure Art Deco, 1930's, plus many other items including an IVALEK CRYSTAL SET and a wonderful CALOR BAKELITE TABLE FAN .. please keep revisiting as I add more items. January 2006 Hope everyone had a nice festive break and now back to the wonderful world of bakelite, I hope over the coming months to add many new features to my site, which hopefully will help people with similar interests. Sunday January the 8th I attended one of the wonderful Art Deco Fairs that Ann Zierold provides on a regular basis across the north of England. This was at the impressive former Speke Aerodrome building in Liverpool, now a superb Marriots Hotel. The terminal building dates from the 1930's, pure Art Deco in style and the interior has been renovated to reflect the Deco period, a personal favourite era of mine. Ann was kind enough to ask me to present my Bakelite lecture in these opulent surroundings, to a very receptive audience, many thanks again Ann. If any of you get the chance to visit one of Ann's fairs, it's a nice day out, I've attended a few, another nice venue being Chester Racecourse. Normally there's plenty of bakelite on view ... so you might just bag a bargain !!! September 2005 ... Another quality radio for the collection, a compact PORTADYNE MINX bakelite set from 1953, works a treat, see the newly created page. April 2005 ... A couple of superb new additions to the collection this month !! A fantastic example of the Bourjois Owl in mottled Blue Bakelite, part of the 1930's Evening in Paris range of perfume holders ... and one of the fabled Michelin Mr Bibendum bakelite ashtrays ... this particular Mr Bib has a tale to tell !! Both items now appear on a newly created page in their honour so please take a look !!! March 17th 2005 ... another new page added, featuring a 1950's Contex Mechanical adding machine, 1950's Made in Denmark, please take a look. 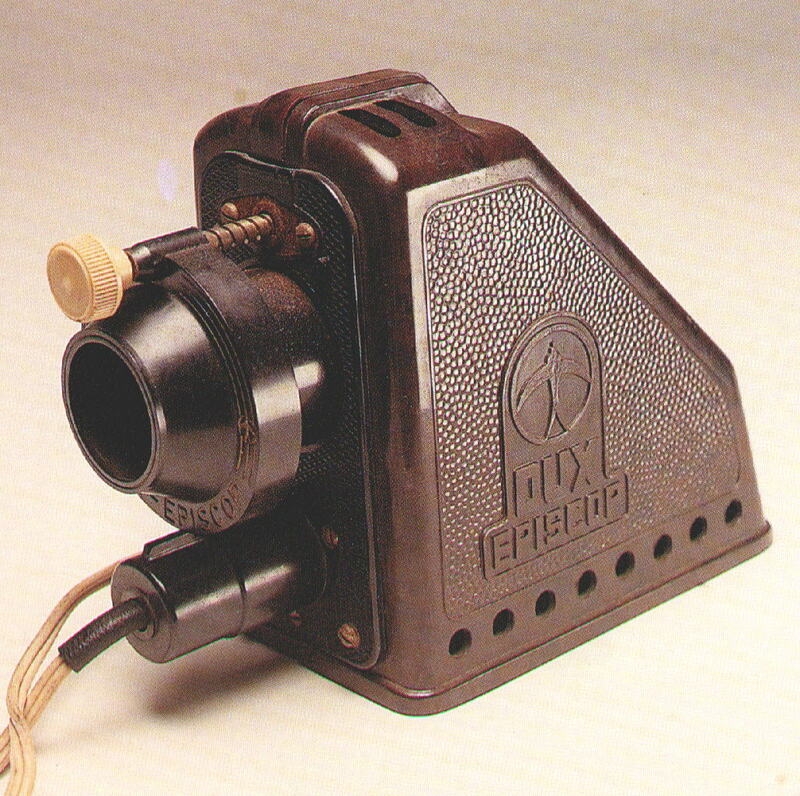 March 2005 , I have added a new page to the site dedicated to an unusual Bakelite wireless receiver the P.A.M. recently added to the collection, as featured in RADIO ART ...Robert Hawes's excellent book on Radio design. This wireless was made around 1946 from war surplus materials. Also the About me page has been revamped to include images of my Bakelite Emporium, established from late 2004 onwards, please take a look !! Also during March 2005 I added a fine example of the Sobell Model 439 Jelly Mould Wireless to the collection ... image on this page and full details on my Radio A to Z Page. 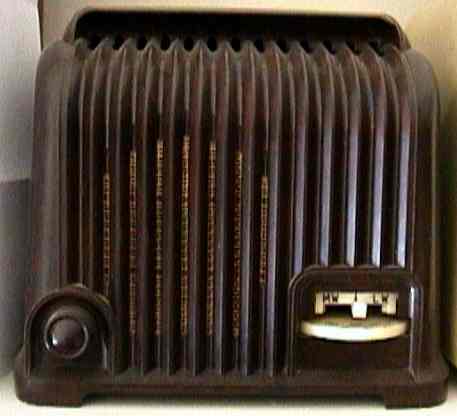 February 2005 and another classic bakelite wireless joins the collection, a 1946 Philips 209U compact three waveband set, with out of body station indicator still intact !! See my Radio/Audio page for details and pics. the other being a far more austere Amplion ADP1Portable Battery Receiver, Made in England, the design of which in my opinion still displayed all the aspects of the economic and practical designs of the war time period. Something about the simplicity of this set I like. The Amplion used the readily surplus materials available post war, and the body consisted of Rexine ? I think, covered plywood. I found a ready made excuse to feature this radio on my site ... the three control knobs are after all phenolic !!! The Amplion featured the then new range of Octal valves which came onto the market during the same year of production 1946. Without a doubt the cheapest radio I've purchased to date. Found recently covered in cobwebs at a local fleamarket for £3 !!!!! Images of both sets now appear on my A to Z Radio Collection Audio page..
November 27th 2004 ... A very important classic find for the collection, my good friend John Mee tips me off about a large mystery bakelite radio for sale at a local second hand bric a brac market .. I rushed down to the venue, and soon agreed a very reasonable price after a bit of bartering !! 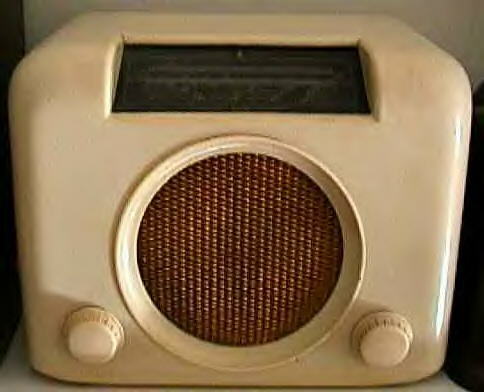 the radio turned out to be a nice example of one of Ekco's fabled range, an A23, made August 1946 one of their first sets to be produced after the end of WWII. Large with pre war design and style very evident ... and it still works after nearly 60 years !! Think I owe John a few beers for the tip off. Pics now appear on my newly created EKCO A23 page.. please take a look ... JoolZ. October 2004 .... A nice Bakelite related article appears in the Independent on Sunday 24th October 2004 ... with thanks to Jasmine Birtles, a link to the article appears on this page. 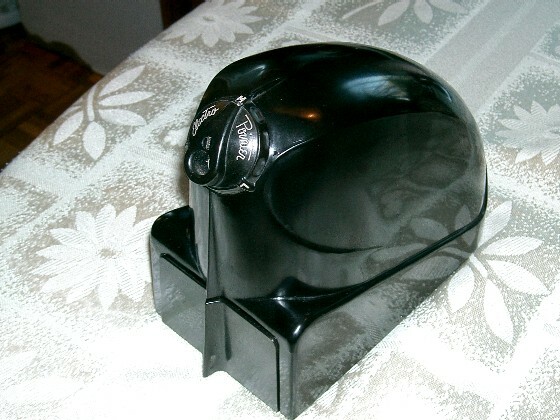 a classic Art Deco Office Pencil Sharpener .. The Electro Pointer Sharpener, heavy black Bakelite from 1941 ... please check out the page I have created for this wonderful item .... many images and a nice story to accompany this beauty !!! August 2004 Just back from our annual visit to Parga Greece, wonderful as ever !! Congratulations to everyone in Greece for the wonderful display put on by the Greek nation staging the Olympics 2004 Yammas everyone !!!! 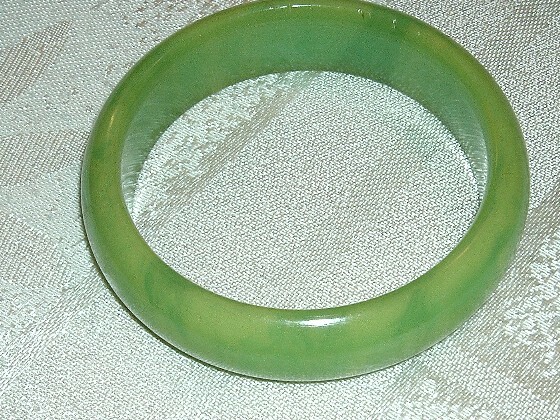 Back in Bakelite mode now, picked up a superb cast phenolic bangle at Chelford yesterday ... the site of my appearance on Boot Sale Challenge recently ... green with yellowish hue, pics to appear shortly on the jewellery page. Apologies to all people who have mailed me whilst on holday, I will get back to everyone shortly after the ouzo, metaxa and sun has worn off !!! 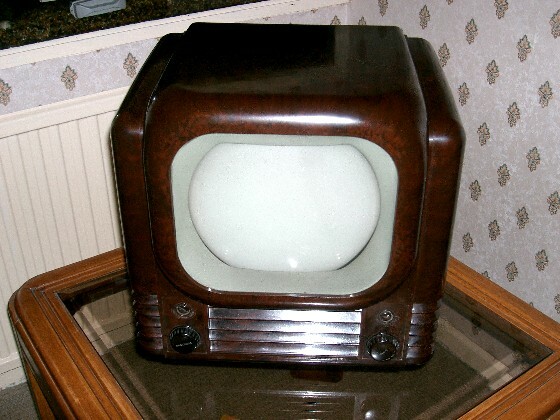 May 21st 2004 .... After many years of searching, I've finally added one of my dream bakelite classic items to the collection ... A 1950 BUSH TV22 BAKELITE TELEVISION !!!! 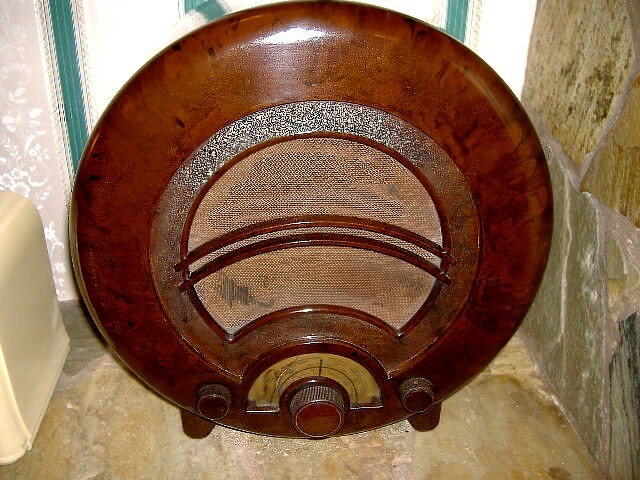 See above ... A new page has been created for this wonderful example of classic bakelite design ... please take a look !! Also I've finally been able to add an example of one of my favourite classic designed radios to the collection, the stylish ribbed Bush Dac 10 Model. Dating from 1950, this model, being push button was evidently rumoured to have been designed to help blind listeners to use their sets with greater ease. Please check out my new RADIO/AUDIO 3 Page for images etc. I purchased this set with bakelite restoration in mind .... so before and after pictures appear.... please take a look !!! Easter Monday April 12th 2004 ... I'm on the telly again !! Filming took place for BOOT SALE CHALLENGE the popular TV programme which goes out during June 2004. Basically two sets of teams play against each other, buying items on a car boot which are then valued by the resident expert. The winning team being the one with the most profit !! My team member was my good friend John Mee and filming took place at one of our regular haunts ... Chelford in Cheshire. DID WE WIN ???? well visit my page dedicated to this fun day to find out !!! March 19th 2004 .. It's my birthday next month and I've just added a superb example of one of the CORONET MIDGET 16mm Cameras to the collection... an early present from my Wife, who I've dedicated a page to entitled KIND HEARTS AND CORONETS !! 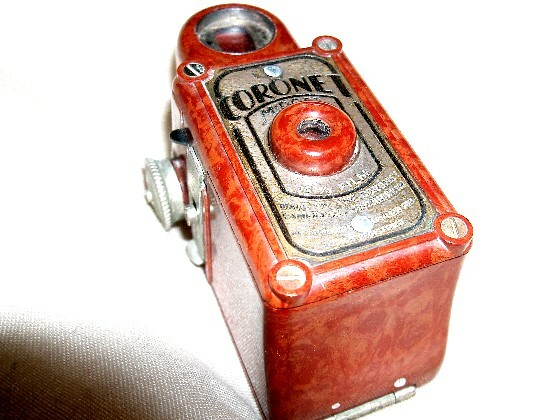 please take a look at this stylish camera from the age of Deco. VP Twin miniature black bakelite camera, complete with carrying case. See photography page for images and details. 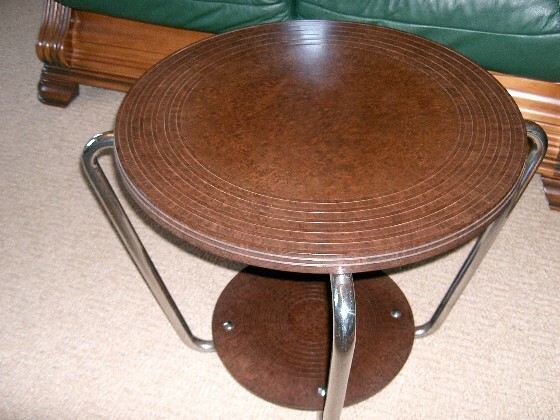 February 2004 I have added a new page .. BAKELITE FURNITURE ... please take a look. Images of a superb coffee table kindly donated to the collection by a lady in Norfolk. January 2004 .. HAPPY NEW YEAR To You all !!! first Bakelite cameras in the UK added to the collection ..The RAJAR No 6, dating from around 1929 ...Picture appears on my Photography page. £1 million at Newton Aycliffe .... Laid by the Chairman of Bakelite Ltd, a certain Mr. H.POTTER !!!! I would love to think that this gentleman was indeed called Harry ! As I have always maintained that Bakelite was certainly a Magical material !!! A link is now available on my Links page to the HYDRO POLYMERS History Archives, have a look and you will indeed find an image of Mr Potter's stone !!! Many thanks to The Advertiser Newspaper for featuring an article on Bakelite and myself today. November 4th 2003 ... After seeing the Daily Mail article last week, Chris Welton the Communications Manager of HYDRO POLYMERS, based at Newton Aycliffe in County Durham contacted me. 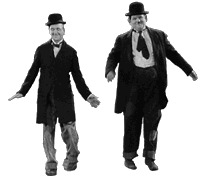 His company were originally set up by BAKELITE Ltd during the 1940's. Chris has kindly invited me to go and spend a day with them and view archive material etc. An invite I'm very pleased to accept and look forward to sometime in the New Year ... thanks Chris !!! October 31st 2003 ... the Manchester Evening News article was printed today !!! October 29th 2003 ... Thanks are due to the DAILY MAIL for publishing today nearly a half page article and photo regarding my love of Bakelite !! My daughter forwarded some information to them, which was used in the PETERBOROUGH column ... a nice surprise indeed !!! Thanks to everyone at this excellent publication. I shouldn't say that really being an ex Express Newspapers employee !!! June 24th 2003 ... The last couple of weeks have been wonderful on the Bakelite front !!! 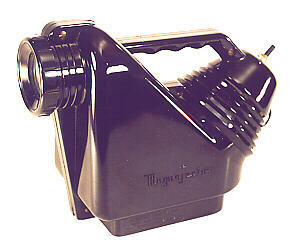 My star find being a 1940's solid black Bakelite Russian Gramophone Player, portable .. I use this term very loosely as the weight of this player is considerable ... I bought this from a guy who operates a haulage firm into and out of the old USSR, he had many items of russian origin for sale ... but in my opinion this was the Red Star !!! sorry about the pun !!! I NOW HAVE IMAGES of this wonderful item on my newly created RADIO/AUDIO 2 FROM RUSSIA WITH LOVE !!! page. Please take a look !!! From the details I already have, Vitaly Brousnikin of Moscow has already confirmed the age of this item and hopefully will provide more information soon. 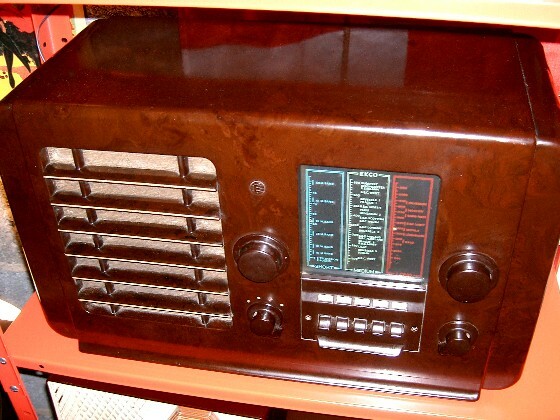 Vitaly has a very good website dedicated to Russian radios and Gramophones ... called RED STAR RADIOS and is an expert in old Russian audio technology. March 2003, Added a DORSET FLINTLESS BAKELITE LIGHTER to the collection, from circa 1953, images of this fascinating item can be found on the SMOKING page. Monday 9th December ... On this page I have reproduced an article and image of the giant Ekco radio press, by kind permission of Tony Thompson of Vintage Radio World. September 2002 ... I managed to obtain a copy of the BBC HISTORY Magazine, September issue, where I have contributed with other Bakelite fans to a charming artcle put together by Betsy Miller regarding Bakelite. Well done Betsy on a concise and well produced article... plenty of information appearing on one page !!! Below appears a good example of the Sobell 439 Jelly Mould Wireless ( Sobellette ) walnut bakelite, nice design from 1949. Added to the collection March 2005 ... more details on my Radio A to Z page. Despite it's Art Deco styling, this Carvacraft cast phenolic double inkwell stand dates from around 1946, manufactured by J Dickinson of Great Britain, was part of a complete desk range.... this was added to the collection Christmas 2002 ....more pictures can be seen on the Household page.... one of the sliding covers is missing and I would dearly like to replace it, if by any chance you have a spare one, please get in contact ... many thanks Jools ... during May 2003 I've managed to aquire another item from the wonderful Carvacraft range ... the ink blotter ... pictures of this item now appear on the Household page. Glossary..Plastics Production .. A to Z. Who made What ? ... Trade Names. Above ... appears a 1951 Dux Episcop child's projector, brown mottled Bakelite with a nice logo to one side. Purchased from a local collectables fair, this item works on the same principal as the Magnajector featured further down this page ....... image: Patrick Cook. Below appears one of the fantastic sets from the EKCO range produced during the 1930/40's period .. this set the A23 was manufactured August 1946 not long after the end of WW2. 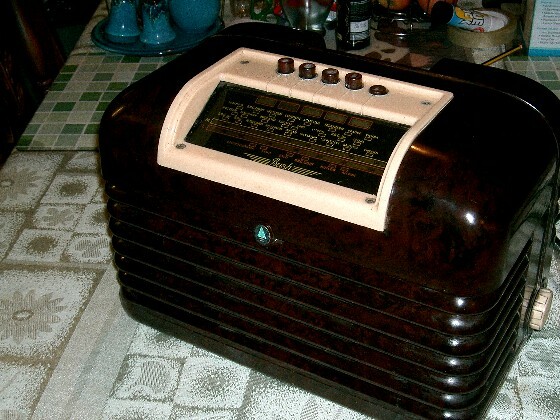 The design of this radio was in fact pre- war, and the quality of the materials used reflects this in my opinion. In good working order, very powerful indeed. Added to the collection late November 2004. Please visit my page dedicated to this wonderful set !!! Welcome to my personal web site! I dedicate the naming of this website to all the dealers out there who when asked the price of an item .... utter firstly the immortal words-" IT'S BAKELITE YOU KNOW" !!! USA. THE CZECH REPUBLIC, ITALY, BELGIUM, GERMANY, SWITZERLAND, INDIA, THE NETHERLANDS,SOUTH AFRICA,EGYPT, UK,CANADA, TAIWAN, KUWAIT, AUSTRALIA, BRAZIL,NEW ZEALAND, HONOLULU - HAWAII, FRANCE, HONG KONG, NORWAY, RUSSIA,AND VENEZUELA ...... Please feel free to drop me a line from wherever you are in this small small world !!! It is certainly nice to see that Bakelite still fascinates people all over the world... !!!!! A Directory of TRADE NAMES ( two pages ) has now been completed 10/08/2001 .... Many worldwide companies are featured. May be of particular interest to American collectors as many old companies are featured from the USA... A recent find ( shown below ) was this magnificent MAGNAJECTOR projector...dating from the 1930's,this stylish simple device - was basically a light bulb,reflecting mirror and focusing lense, encased in a black bakelite case complete with integral handle and ventilation slots....winner of a design award the MAGNAJECTOR projected and illuminated an image of whatever it was placed on !!! of this superb table !! Below a Classic Art Deco Black Bakelite Office Pencil Sharpener from 1941, the Electro Pointer ... made in the USA. Kindly donated by Nick Arnold. 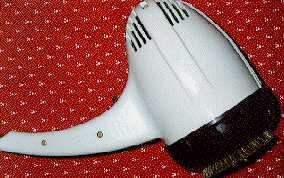 A page has been dedicated to this item within the site. Brief Encounter of an EKCO Kind !! Baekeland created Bakelite by combining carbolic acid and formaldehyde, derived from coal or timber. The brittle resin compound that is the product of this combination is allowed to cool before being ground into powder form and, usually, mixed with fillers such as wood flour (effectively, fine sawdust) or cotton. Pigments for colouring are added at this stage. 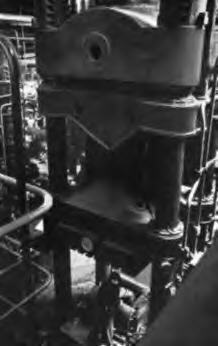 Catalysts and other chemicals are then added and the mixture heated to create a thermosetting compound that required great heat and pressure to make it melt. Finally the resin compound is re-ground into powder and pressed into blocks known as pre-forms for use in moulding presses such as the Ekco 500 ton hydraulic press pictured below. Inserts such as brass screw retainers may be added to the mould before the pressure casting. Under great pressure and considerable heat the powder pre-forms become a viscous liquid that flows into the steel cabinet mould. The polymer material then forms cross links and sets permanently, retaining the exact contours of the original mould. Removed from the mould, any 'flash' (excess plastic around the mould extremities) is trimmed or ground away and another cabinet shell is completed. 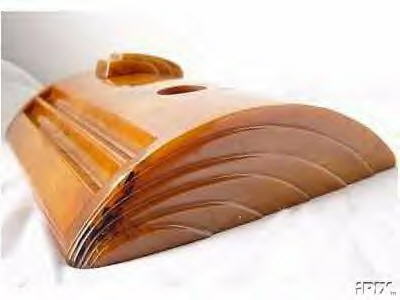 Because the original mould must be both extremely well made and finished and also be capable of withstanding the great pressures involved in the moulding process, the work of the mould maker was - and still is - highly skilled. The moulds themselves represent a high financial investment and it is only the concept of mass production that make their use economical. As a crude illustration of this, think about a single cabinet produced from such a mould. That solitary cabinet cost the total of the tooling cost - mould production cost - to make. However, produce 1,000 cabinets from the same mould and each will have cost little more than one-thousandth the cost of the original mould. This example is extremely simplified and there are many other factors to take into account if a true picture of manufacturing costs is to be appreciated - but the principle is correct. Compare with the production of wooden cabinets. Each will cost a finite sum, virtually regardless of the number produced (again, in simplified terms). So, 1,000 wooden cabinets will cost nearly 1,000 times more than a single cabinet. Ekco 500 ton hydraulic Press shown below.. 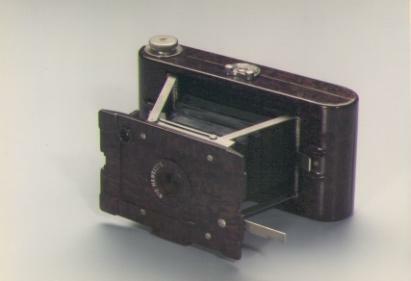 The above picture shows a HAWKETTE NO 2 FOLDING CAMERA circa 1929, nice mottled Bakelite, full working order, a nice find !!!! 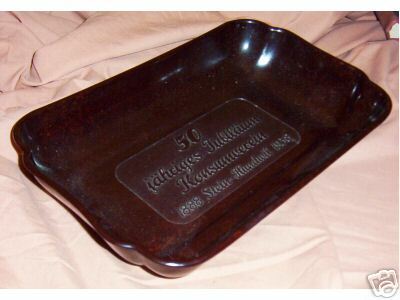 Below appears a commemorative Swiss Tray with the following inscription in German .... 50 Jahriges Jubilaum Konsumverein, 1888 Stein - Hundwil 1938. Initially I thought this was indeed a German item, but research tells me that Stein and Hundwil are in fact Swiss Villages/Towns. My German is not so good but I presume this was a piece to celebrate 50 years of trading.